Hi all! 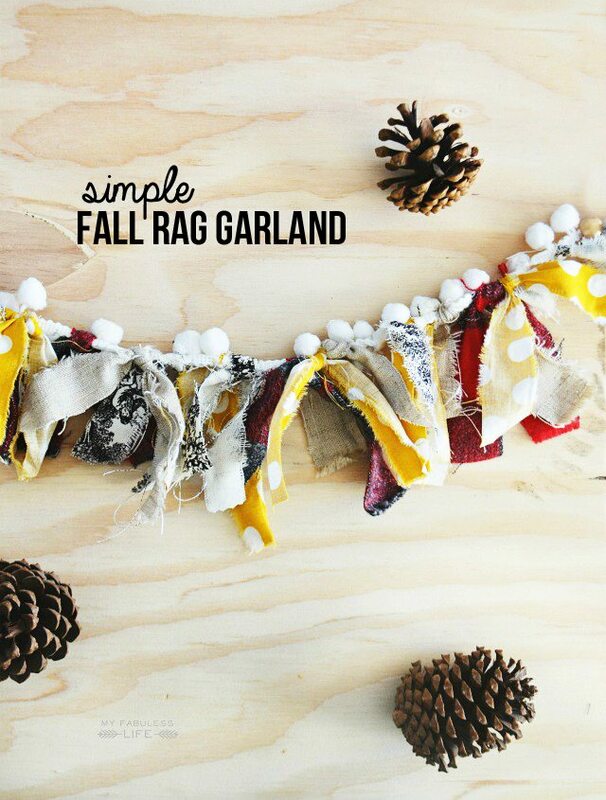 It’s Jenn from My Fabuless Life and I’m so excited to be back here at Live Laugh Rowe with a simple fall rag garland tutorial! 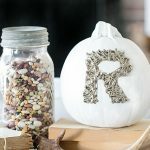 With the next three months being full of holidays, I’m all about DIY decorations that bring the feeling of the season into my home, but don’t take a lot of time and fuss, and don’t cost a lot of money, since they’ll only stay up for a month or two. 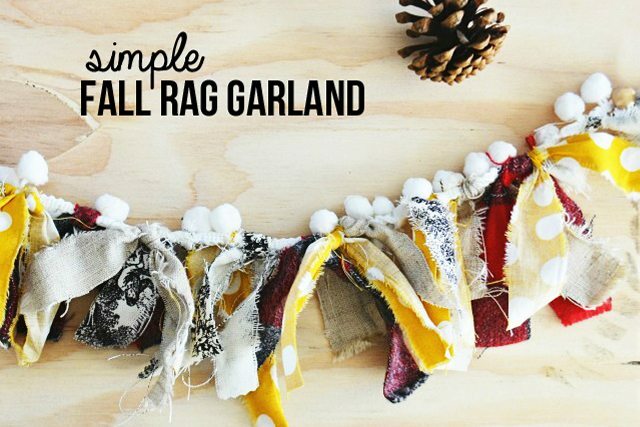 Today I’ve got a simple pom pom rag garland to share with you that’s perfect for fall and Thanksgiving (or any holiday really, because you get to choose the fabrics)! 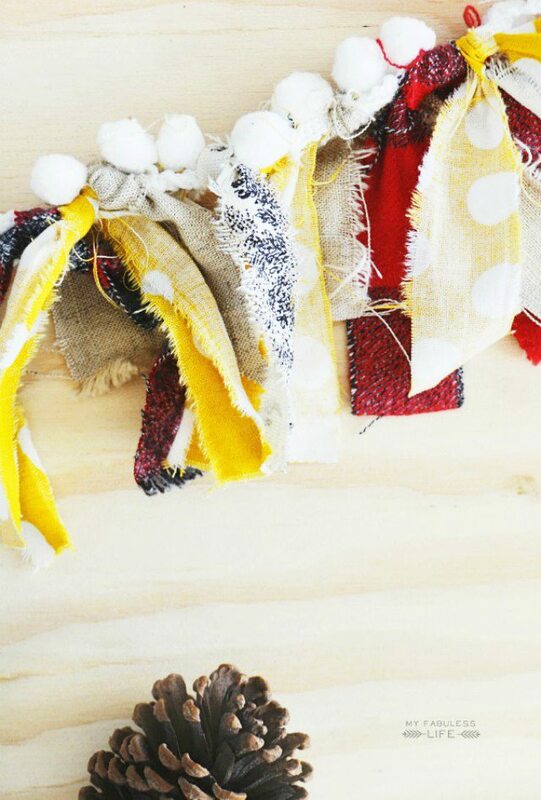 For my fabrics, I used linen, some canvas toille, plaid flannel left over from my other fall decorating, and a yellow polka dot remnant I picked up at Hobby Lobby. I have to say, I’m really in love with how the different patterns, textures, and weights of fabrics ended up looking together! 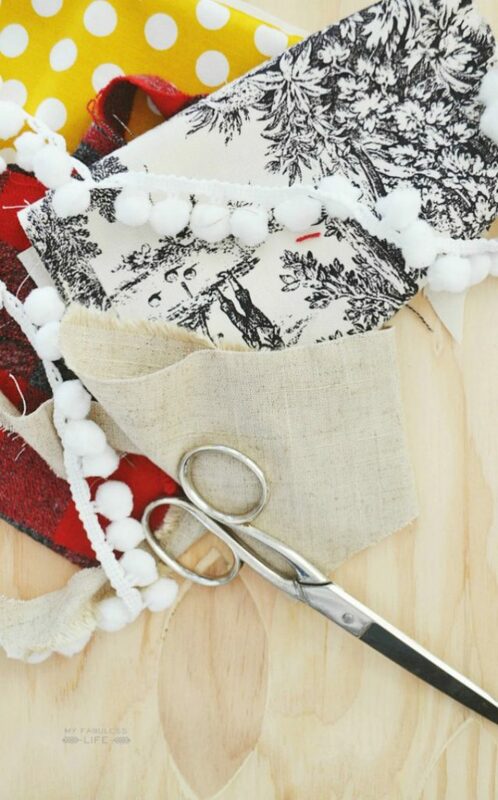 Start by cutting notches in all of your fabric so it makes it easy to tear it into strips. 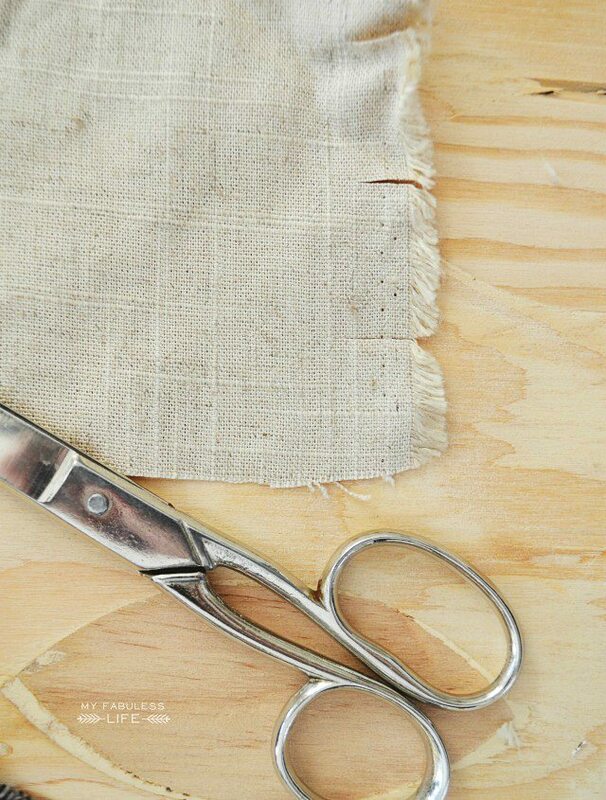 If you like a cleaner look without frayed edges, you can cut the fabric into strips, or use pinking shears (the zigzag scissors) to cut the strips. Then, grab yourself a cup of coffee, turn on your favorite series on Netflix (I’m currently binge watching The Blacklist) and tear all of your fabric into strips. Have I said the word “strips” enough yet? One little note: the heavier fabrics are a little harder to tear and will fray a bit more than the cottons. 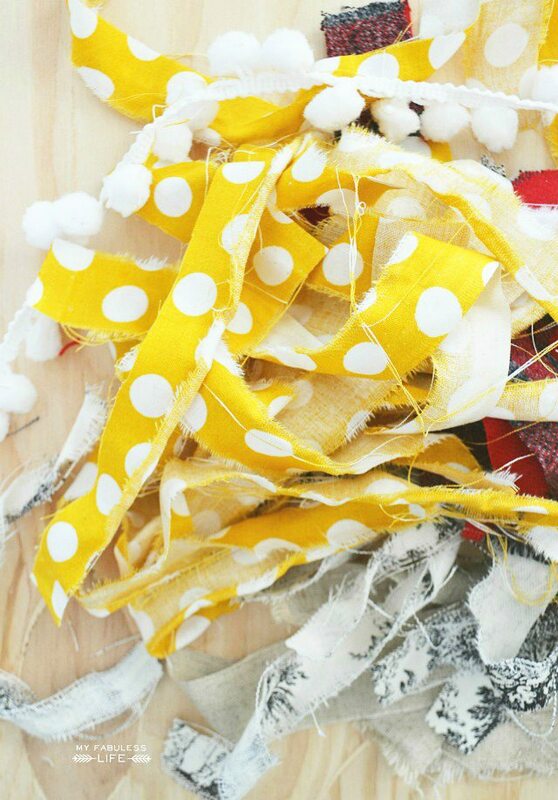 Then, tie the pieces of fabric in between the pom poms on the trim. 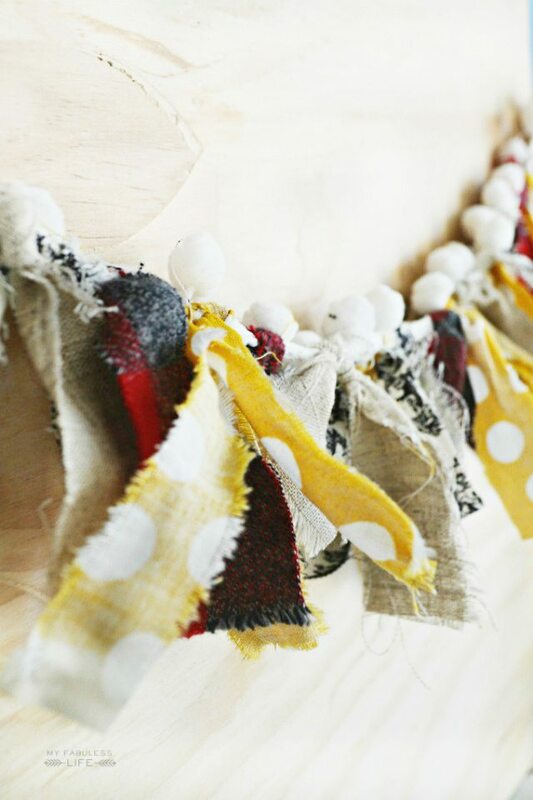 (Tie them like the first step of tying your shoe–no fancy knots here.) I was very sporadic with mine–in some places I tied between each pom pom, and in other places, I left two in between. 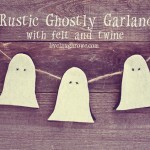 Just keep tying more on until you get the fullness you want. That’s it! 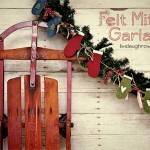 A simple garland you can put together in less than 30 minutes! Great DIY. Love love Jen! 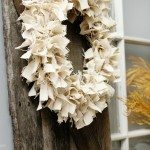 Totally bought all the stuff to make this this morning! I can’t wait to get started. No such thing as a bunch of fabric scraps laying around in my house so I just bought the little sample sized thingies at Wal-Mart. Can’t wait to finish! Thanks!